Even 24 hours later, this kind of result still feels like a kick in the nuts. After neither the performance or the result against West Ham, at least against Spurs there were plenty of bright spots (in the middle 80 minutes at least). 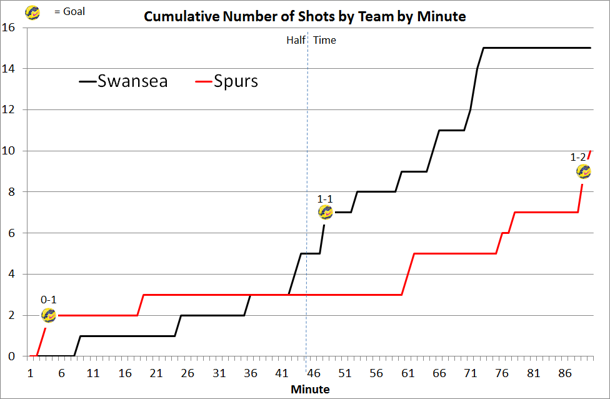 Ultimately it was a couple of basic errors that got punished and although there was some good build up play by Swansea in the second half, really big chances were a rarity. I could spend an age dissecting this game but life's too short. One thing I am confident of though is that at least once this season it'll all click for 90 minutes and we'll stick 5 past somebody. If you haven't already, give the latest AI Analytics podcast a listen, Swans get a mention in the middle as possibly being in an inflated position given their overall stats this season. I can't disagree with the numbers but overall I think our position is a fair one and due to the ability we've had generally to beat the 'poorer' teams in the league this season as well as generally keeping things tight (thanks in part to Fabianski who was missed yesterday).